Chief Warrant Officer Three Hershel D. McCants, Jr., died Feb. 18, 2007, in southeastern Afghanistan when his MH-47E Helicopter crashed while conducting operations in support of Operation Enduring Freedom. He was born on April 2, 1973, in Medford, Oregon. McCants originally volunteered for Army service as a combat engineer in October of 1991. He attended basic and advanced individual training at Fort Leonard Wood, Mo. After an initial assignment as a combat engineer at Fort Bragg, N.C., McCants attended the Special Forces Engineer Course. Upon graduation he was assigned to the 1st Special Forces Group, Fort Lewis, Wash. McCants was accepted into and graduated from the U.S. Army Warrant Officer program in 2000 at Fort Rucker, Ala. In 2001, he attended the Aviation Warrant Officer Basic Course and Initial Entry Rotary Wing training. After completing his UH-60 Blackhawk Helicopter qualifications at Fort Rucker, Ala., McCants was assigned as a Tactical Operations Officer and an Aero Medical Evacuation pilot with the 54th Medical Company, 62nd Medical Brigade, Fort Lewis, Wash. 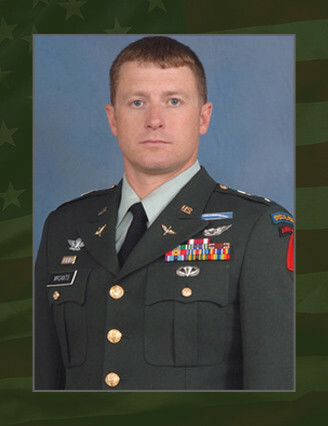 He applied and successfully assessed to serve in the 160th Special Operations Aviation Regiment (Airborne) in 2005. He was assigned to B Company, 2nd Battalion, 160th SOAR(A) at Fort Campbell, Ky., where he served as a MH-47E Chinook Helicopter pilot. McCants’ schools include the Survival, Evasion, Resistance and Escape Course, CH-47 Aircraft Qualifications Course, Special Operations Training Course, SAPPER Leader Course, and Combat Life Savers Course. His awards and decorations include the Meritorious Service Medal, two Army Commendation Medals, four Army Achievement Medals, Joint Meritorious Unit Award, Army Good Conduct Medal, National Defense Service Medal, Afghanistan Campaign Medal, Global War on Terrorism Expeditionary Medal, Global War on Terrorism Service Medal, two Humanitarian Service Medals, two Non-Commissioned Officer Professional Development Ribbon, Army Service Ribbon, Army Aviator Badge, Expert Infantry Badge, Airborne Badge and Air Assault Badge. He was posthumously awarded the Meritorious Service Medal. He is survived by his wife, Shannon, son, Trevor (11), and daughter, Kylie (11 months). McCants’ mother, Goldie Murphy, and father, Hershel D. McCants, Sr., also survive him.